Reliable Lube Technician who is well-versed on the different engineered fluids being used in vehicle maintenance. Adept at delivering superior customer service putting the proper fluids in a customer’s vehicle and explaining the service process to clients. Specializes in administering fluids and taking care of the customer service end of the process. Responsible for doing a materials inventory once a day and submitting results to the corporate office. Assisted in setting up each customer order and making sure the customer’s requirements were met. Often asked to assist in doing maintenance work on older vehicles. Assisted in describing service options to customers and filling out the proper service paperwork. Often asked to assist customers that have issues or complaints. Responsible for doing an inventory check on all synthetic lube products and submitting daily results to management. Assisted in maintaining the proper inventory levels on all fluids. Assisted in taking care of customers with older or vintage vehicles. There are plenty of opportunities to land a Lube Technician job position, but it won’t just be handed to you. Crafting a Lube Technician resume that catches the attention of hiring managers is paramount to getting the job, and LiveCareer is here to help you stand out from the competition. Responsible Lube Technician that is able to handle minor vehicle repairs as well as comprehensive maintenance tasks. Committed to learning the proper ways to maintain all makes and models of vehicles, being part of a strong team and being given the chance to learn leadership skills. Anxious to turn a lifetime of working on vehicles at home into a challenging job. Delivered food and beverage orders to approximately 30 homes per shift. Handled customer complaints, handled money and credit card transactions, prioritized tasks. Assisted in other aspects of food service when needed. The idea of transitioning into a new career can be both exciting and overwhelming. In order to promote yourself in a way that is likely to get you hired, be sure to focus your resume on the skills you posses that are needed in the new industry to show that you have what it takes to handle the job at hand. Take a look at the above Package Handler no experience resume sample as a model for your own results-driven resume. Employers need lube technicians who can work quickly and efficiently, often under distracting conditions. They also need pros who can interact in a friendly and positive way with customers. As you create your resume and submit your application to an auto facility, remember to highlight your experience in these specific areas. You can service a lubrication system, but you can also help your employer gain customers and make money. 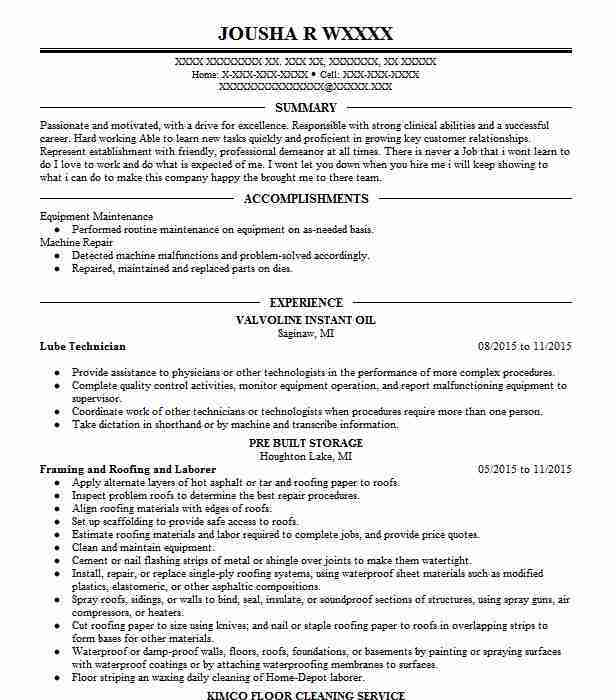 Highlight your strongest skill sets in a section of your resume called core competencies, and format the rest of your document using the structure of this lube technician resume example. Lube technicians are specialized automotive professionals who make sure that vehicles run properly and smoothly. 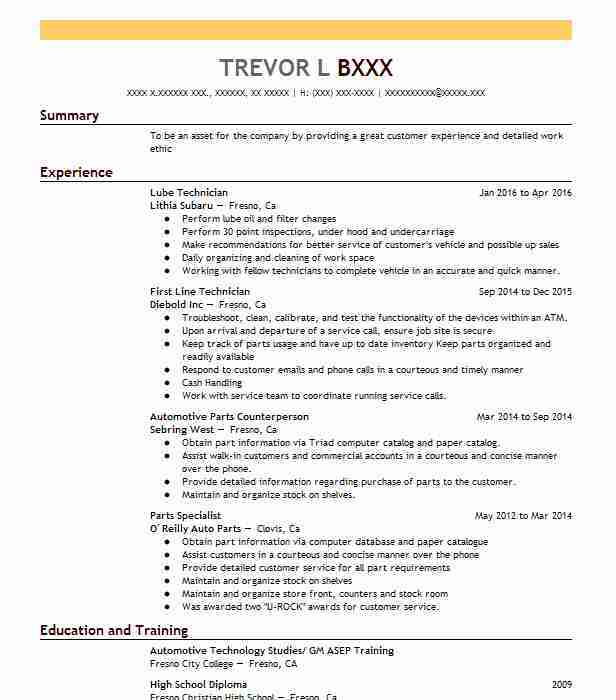 The resume examples below are designed specifically for people seeking to get hired as a lube technician. Use them as a model in creating your resume, and impress employers with your professionalism. Get started on your resume today with these resume examples, and start working as a lube technician sooner! Searching for jobs as a lube technician, as anywhere else, isn’t just a matter of luck, but of strategy. By following the tips below, you’ll be able to start your own job hunt off on the right track. 1. Make a plan. Writing down an outline and schedule of your search tactics from the start will keep you on task and help you avoid distractions. Take your job hunt as seriously as the job you will get. 2. Arrange information interviews. Talking with someone working in your chosen field or at your preferred employer is a good way to learn more about a position, and give you clearer ideas of what they are looking for in employees. 3. Take assessment tests. Assessing your skillset can give you a better picture of what opportunities may be open to you. Your aptitudes might qualify you for different positions, or work in new fields. 4. Seek leads everywhere. Along with online searches and job banks, check out offline newspaper ads, and look up local companies that may be hiring. You never know where you might find an opening. 5. Prepare yourself. As well as making a schedule or plan, you should also mentally and emotionally brace yourself for what may be a challenging process. Starting your search for jobs as a lube technician with the right mindset will help keep you moving forward. Across any industry, a strong resume is an essential part of a successful job application, whether you’re applying for jobs as a lube technician or anywhere else. The following guidelines will make sure your resume is up to par. 1. Include necessary contact information. One phone number and one professional email address should always be in your resume’s header. Don’t list your street address, or extraneous personal information such as your age, gender or a picture of yourself. 2. Start with a summary. Rather than a statement of objective, open your resume with a professional overview, four to six lines introducing your most relevant experience and skills. 3. Avoid abbreviations. Acronyms and other abbreviations can often vary widely between companies even within the same industry. To forestall confusion, only use very common abbreviations, and write out other phrases the first time they’re used on the resume. 4. Double check your spelling. Any error on a resume can appear sloppy, showing a lack of attention to detail. Always proofread, and don’t just rely on spellcheck, which can miss homonyms. 5. Leave off the references. While it’s acceptable to end with “References available upon request” if there is room, any requested references should be placed on a separate page. Lube technicians change oil and filters, but they also interact with patrons, which means they keep one foot in technical service provision and one foot in sales and customer relationship management at all times. Employers know this, so when they search through a stack of resumes, they look for communication and service skills as well as technical experience. 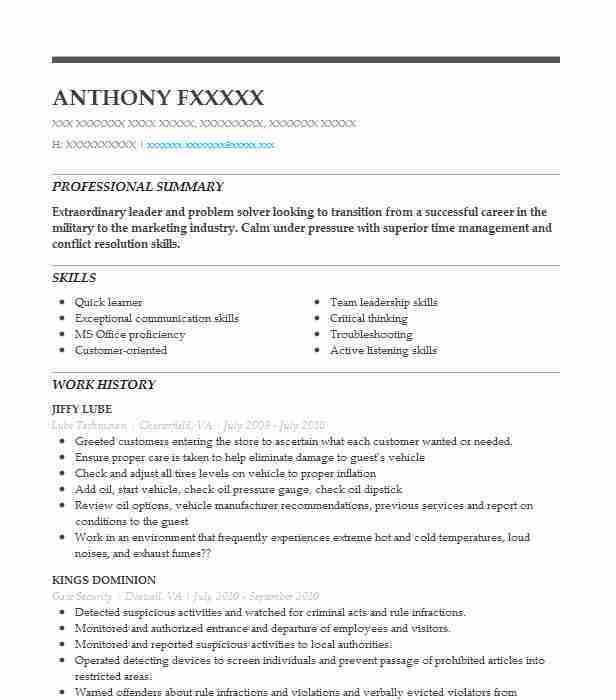 Highlight both qualities on your resume by reviewing this lube technician resume example and modeling your own document along the same lines. Divide your resume into similar subheadings and draft a short, clear summary that will appear at the top of your profile. Love to work on cars? Consider a career as a lube technician. A lube technician is a skilled automotive professional who are experts in all of the things that make a car run: oil, air filters, brake fluid, tire pressure, and more. To get a lube technician job, you’ll need the right training and a professional resume. Use our resume examples as a model to create your own resume, and win the job faster. 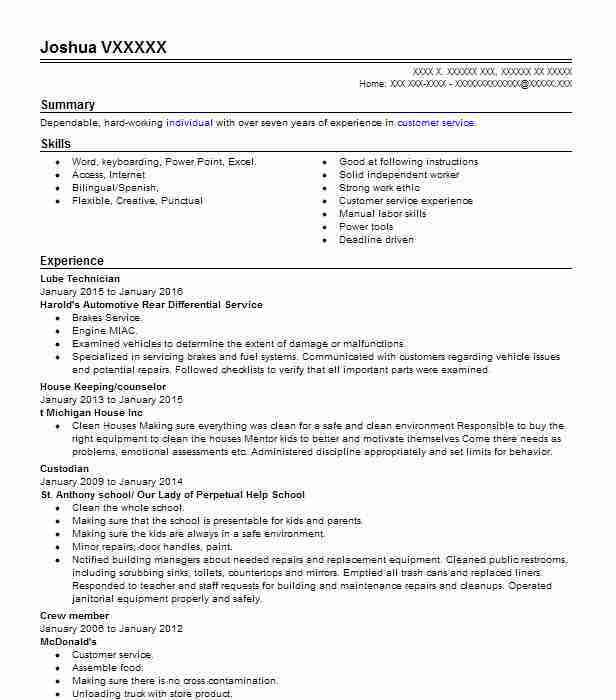 Just click on one of the resume example templates below to get started. Finding jobs as a lube technician, just like in any other part of the country, takes skill and effort as well as the right mindset. The following tips will help you develop the tools necessary to make your job search easier. 1. Network as much as possible. When seeking a job, it’s important to be proactive. Networking, both in person and online, is a great way to get your information in the hands of hiring managers. Utilize your connections while also finding ways, such as email or LinkedIn, in which you can make contact with the company for which you want to work. 2. Make a plan and stay active. It’s important to keep moving forward, not only with your job search, but also with your current employment. Temporary work can be beneficial, both financially and mentally, while you are searching for a long-term employment solution. The more active you are in both your search and your current state of employment, the more opportunities will arise. 3. Be proactive with your online presence. Social media, as well as a blog or landing page with your resume or CV, is a great way to get your name and information in the hands of prospective employers. Use your various social media accounts and online tools to present yourself as a professional, reliable employee. Companies, now more than ever, can find exactly what they’re looking for online. 4. Follow up on all leads. Oftentimes, employers are swamped with hundreds of resumes to choose from. It’s easy for you to get lost in the shuffle, which is why following up is a great way to show a potential employer that not only are you proactive by nature, but that you truly care about the position for which you applied. 5. Prepare yourself for a long search. Look down the road, as searching for new employment can take time, and set goals for where you’d like to be in your search a year from when you start. Any goal reached will get you in the mindset of being positive about, and patient with, your search. 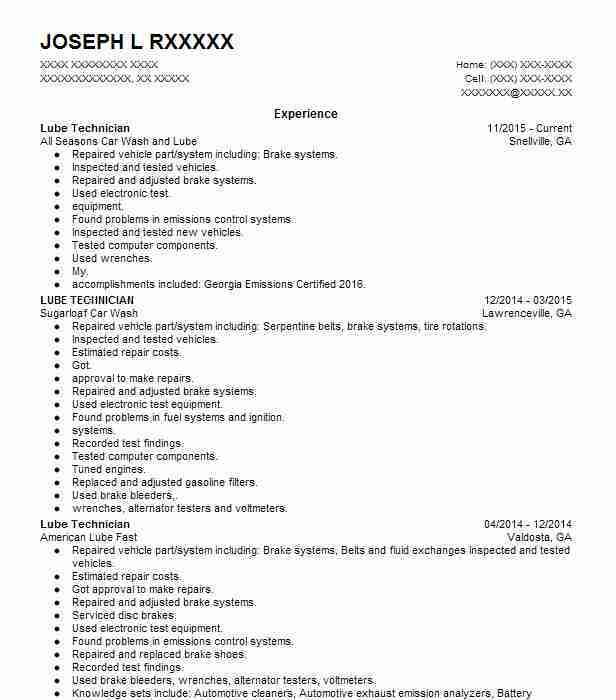 When looking for jobs as a lube technician, your resume is of the utmost importance “ it is your chance to get your foot in the door and land a job interview. Your resume should be clear and concise, showcasing your skills and experience as they relate to the job you are seeking. There are simple tips that will help you create the standout resume you need. 1. Your resume should not exceed two pages, as things get bogged down and tiresome past that point. Remember, you want to keep the hiring manager intrigued with your prospects, not bored by an unintelligible transcript of why you want the job. 2. Make your resume stand out with a design that’s not like anyone else’s. 3. Avoid using personal pronouns (I, me, my). 4. Make sure you list your jobs in reverse chronological order. 5. Make sure all info on your resume is relevant. Hobbies and other info of that sort should be avoided. Summary: Dependable, hard-working individual with over seven years of experience in customer service.